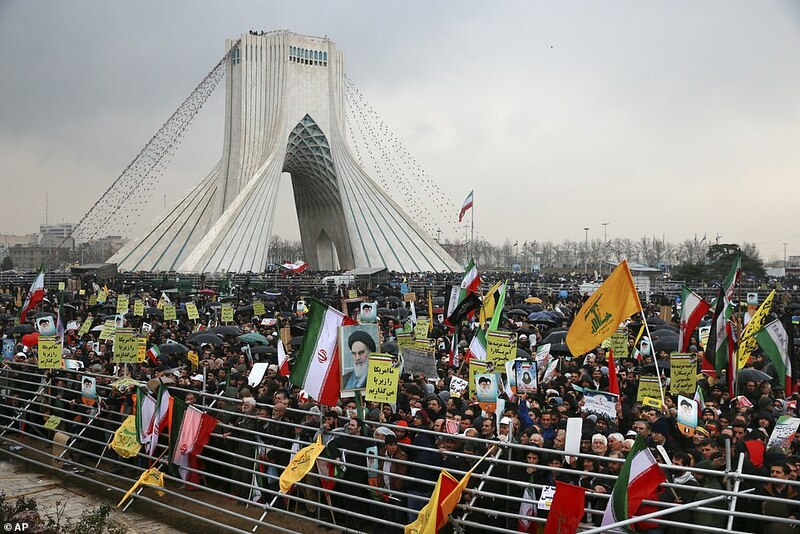 Crowds chanted ‘Death to America, death to Israel’ as hundreds of thousands of Iranians gathered at rallies to mark the 40th anniversary of the Islamic Revolution. 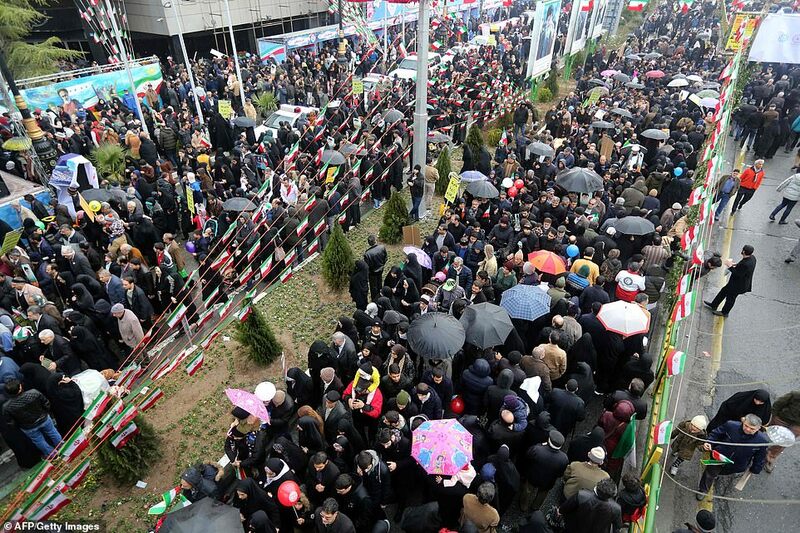 Ceremonies were held across Iran today to observe the anniversary of the fall of the Shah and the triumph of Ayatollah Ruhollah Khomeini, the Shiite cleric who led the coup. 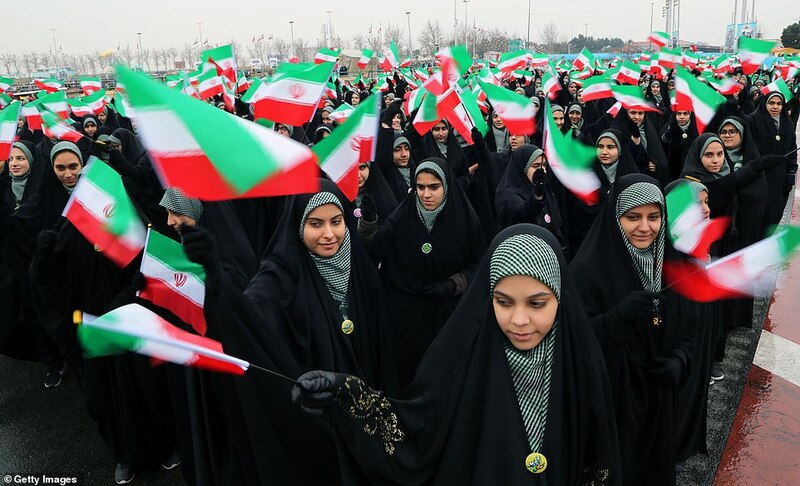 Iran’s army declared its neutrality on February 11, 1979 which paved the way for the collapse of Shah Mohammad Reza Pahlavi – and ousted the United States’ most important ally in the Middle East. 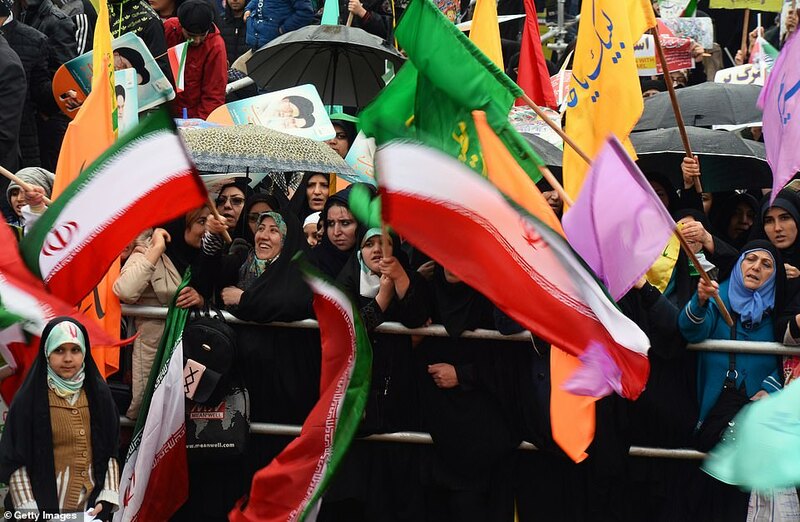 Crowds gathered in the rain in Tehran Azadi, or Freedom Square, on Monday, waving Iranian flags and chanting ‘Death to America’ – a mantra that has been standard fare at anti-US rallies across Iran. 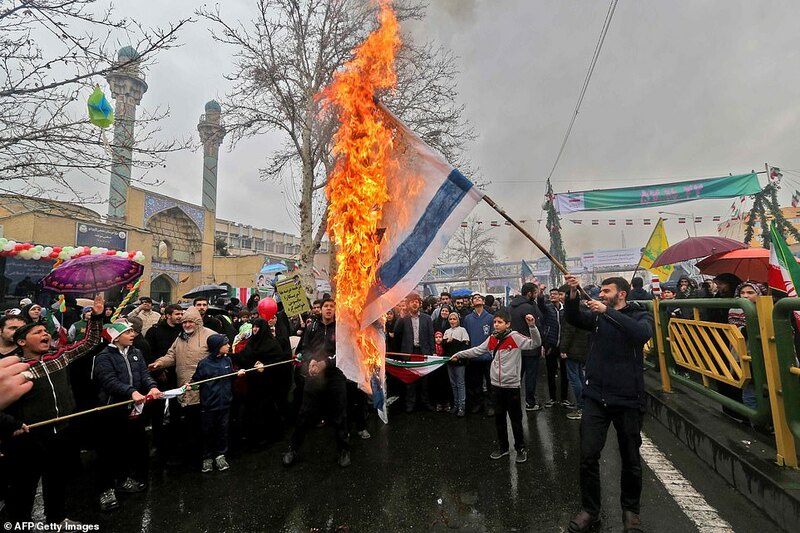 Chants of ‘Death to Israel’ and ‘Death to Britain’ followed, and demonstrators were caught on camera burning US and Israeli flags. 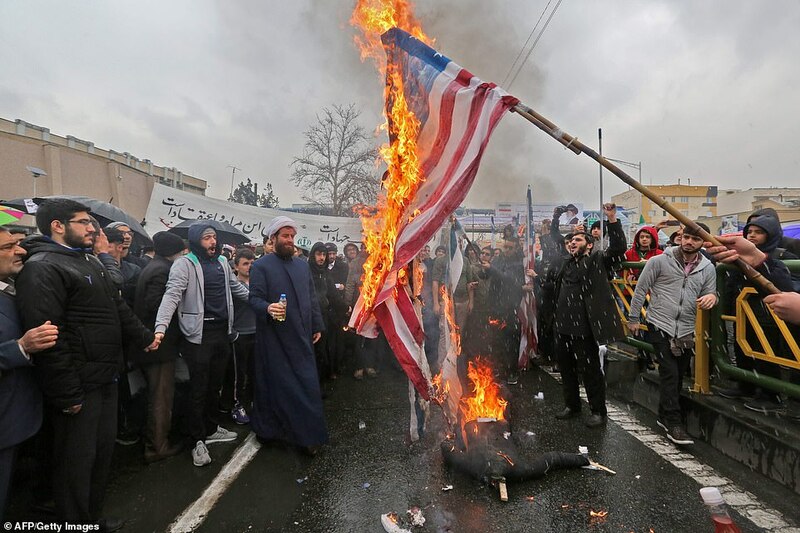 Yadollah Javani, a senior commander in Iran’s elite Islamic Revolutionary Guards Corps, threatened to burn two of Israel’s cities ‘to the ground’ if the US attacked Iran when speaking at a rally on Monday. 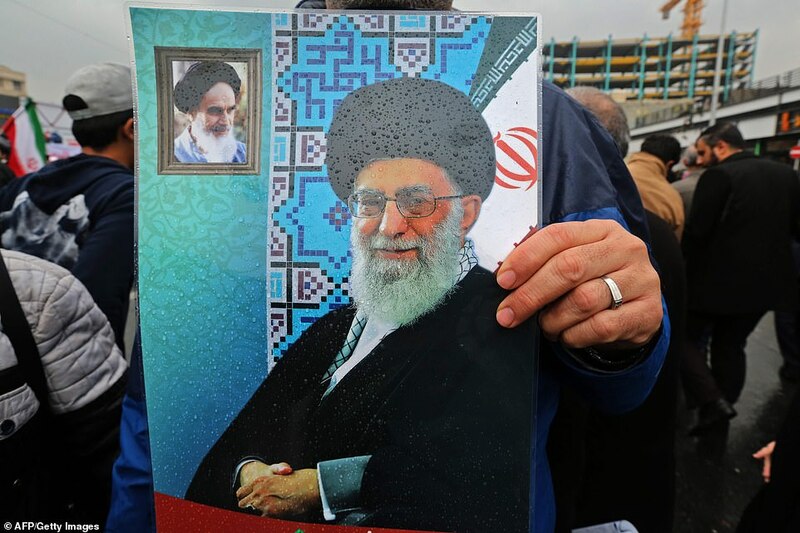 Soldiers, students and clerics flocked to the streets of cities and towns across Iran – many carrying portraits of Khomeini and Iran’s current Supreme Leader Ayatollah Ali Khamenei. Another said: ‘Down with USA, Down with Israel, Victory to Islam’. One group were even caught on camera burning a statue of US President Donald Trump. 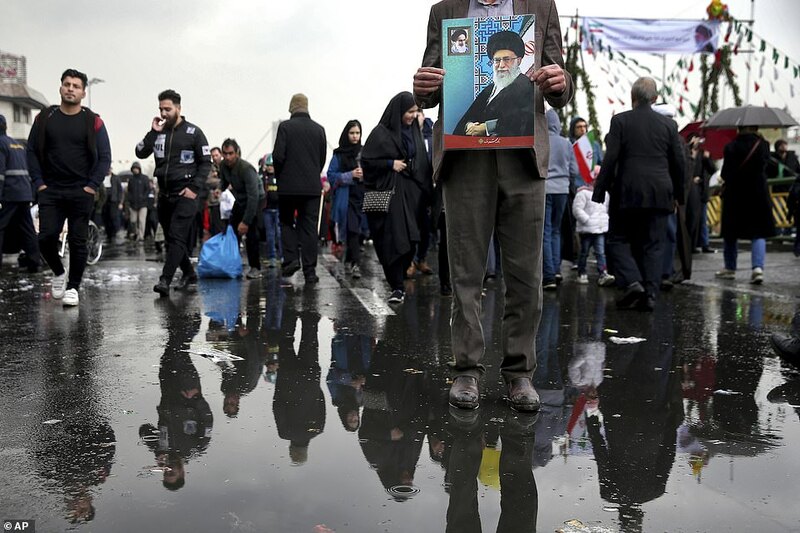 Every year, the anniversary festivities start on February 1 – the day Khomeini returned home from France after 14 years in exile to become the supreme leader as Shiite clerics took power – and continue for 10 days, climaxing on February 11. 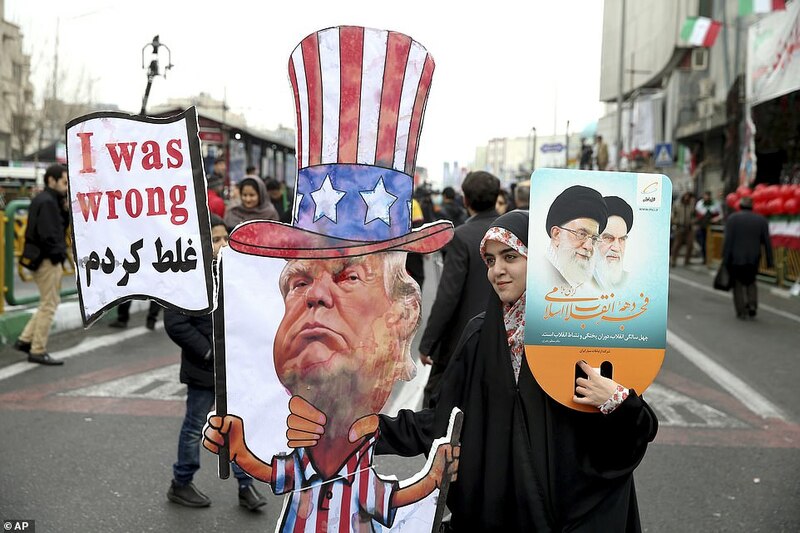 This year’s anniversary comes as tensions rise with the United States and Iran grapples with the aftermath of President Donald Trump’s pullout last May from the 2015 nuclear deal between Iran and world powers. 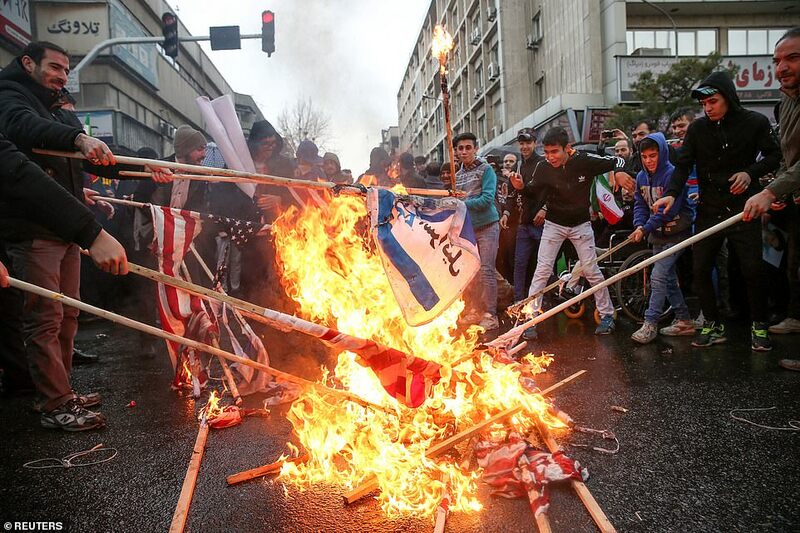 Tough US economic sanctions were also re-imposed on Iran in November. 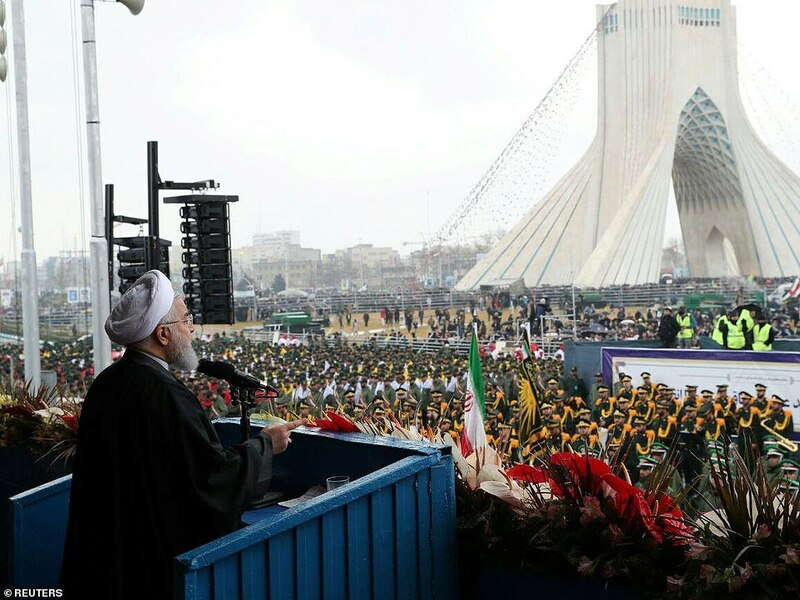 Speaking from a podium in central Tehran, Iranian President Hassan Rouhani addressed the crowds for nearly 45 minutes, lashing out at Iran’s enemies – America and Israel – and claiming their efforts to ‘bring down’ Iranians through sanctions will not succeed. 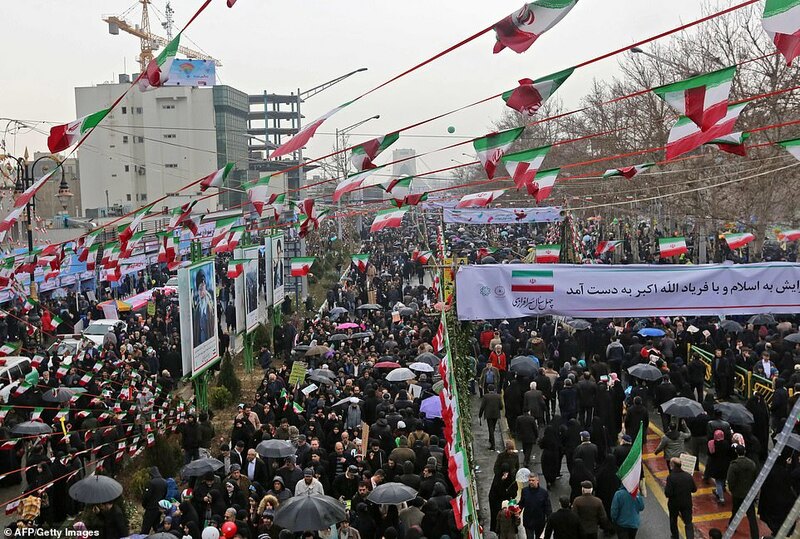 In the backdrop to Monday’s marches, the military displayed Iranian-made missiles, which authorities showcase every year during anniversary celebrations and which now have a range of up to 2,000 kilometers and are able to Israel and US military bases in the region. 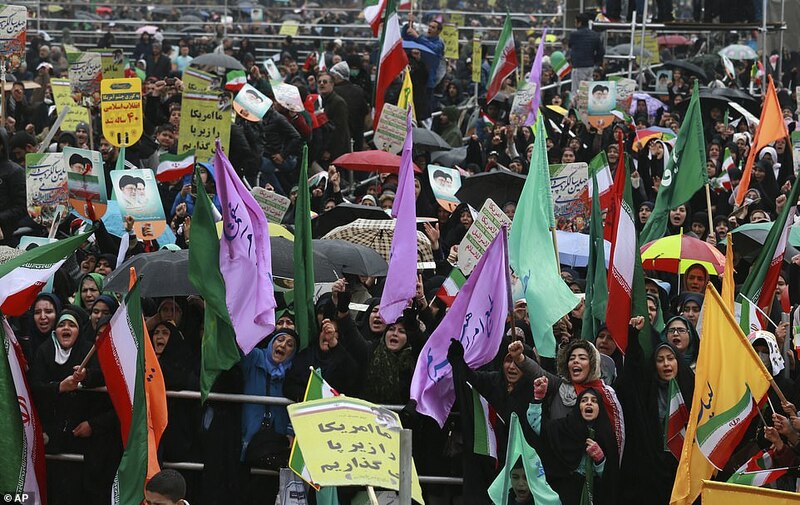 Washington alleges Iran’s launches defy a UN Security Council resolution calling on Iran to undertake no activity related to ballistic missiles capable of delivering nuclear weapons. 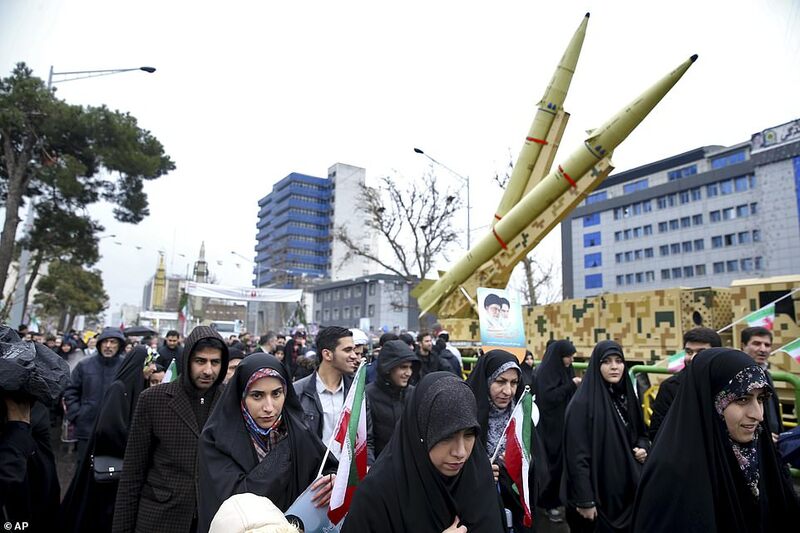 Tehran denies the charge, insisting its satellite launches and rocket tests do not have a military component. 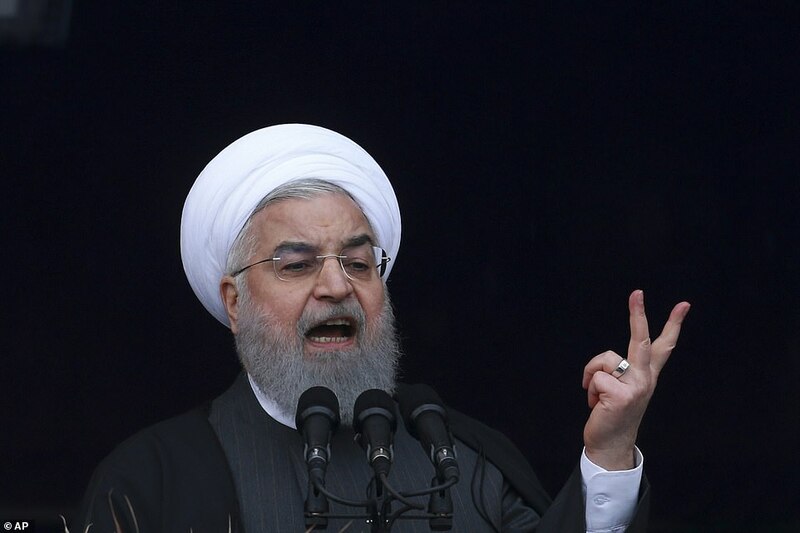 ‘We do not and we will not ask permission for producing any type of missiles from anybody,’ Rouhani said in his speech Monday, though he stressed that Iran would ‘continue constructive engagement’ with the international community. 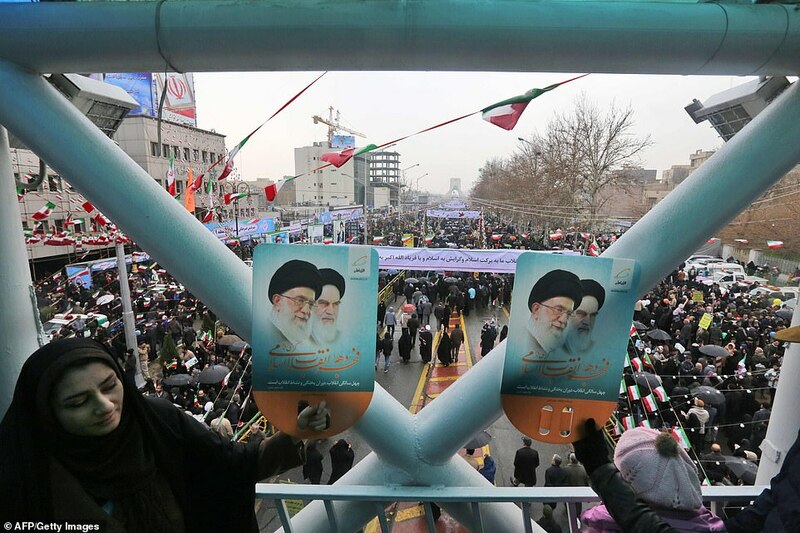 Rouhani also promised the crowds that Iran would overcome the economic hardship amid the country’s spiraling economy and the newly imposed US sanctions. 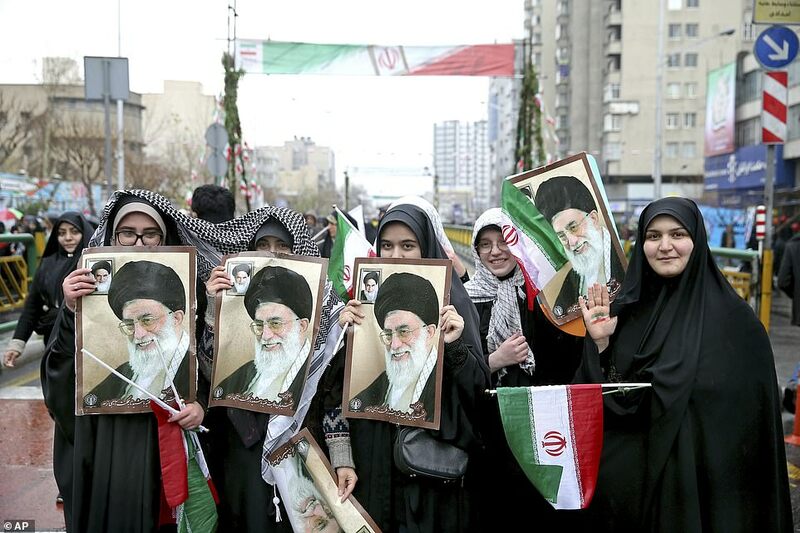 What was the Iranian Revolution? 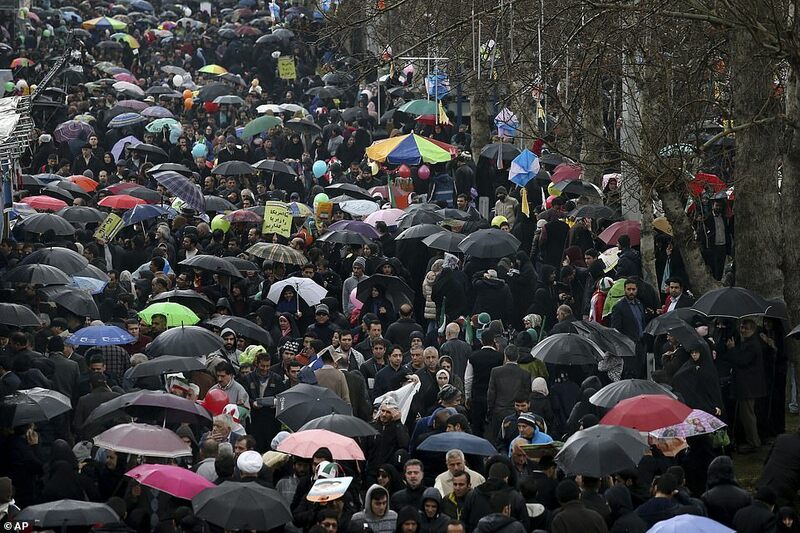 The Iranian, or Islamic, Revolution was a popular uprising which took place in Iran between 1978 and 1979. This coup, which resulted in the collapse of the country’s monarchy on April 1, 1979, led to the establishment of an Islamic republic in Iran. 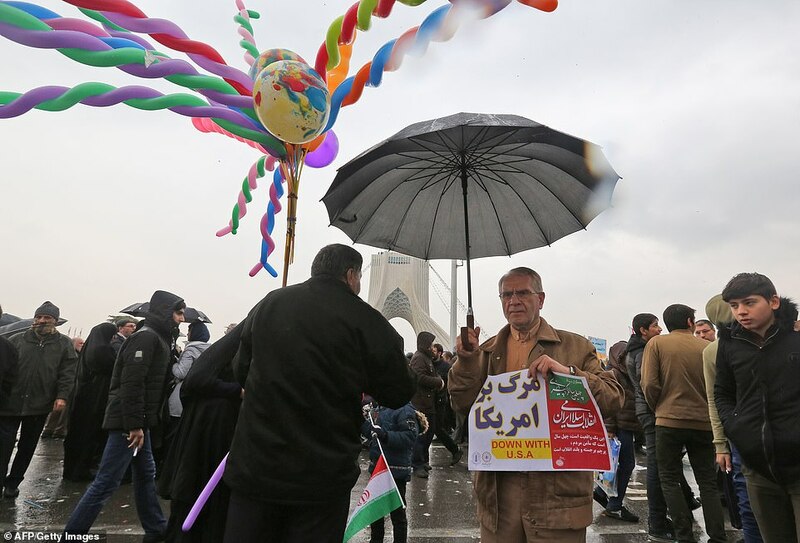 It was the result of increasing social discontent in the country throughout the 1970s – with economic difficulties, and sociopolitical repression under the regime of Mohammad Reza Shah Pahlavi, adding to restlessness in the masses. There was also a strong opposition to the Shah due to US support for his regime. The Shah had introduced a series of unpopular liberalization policies in order to retain the support of America in 1977. 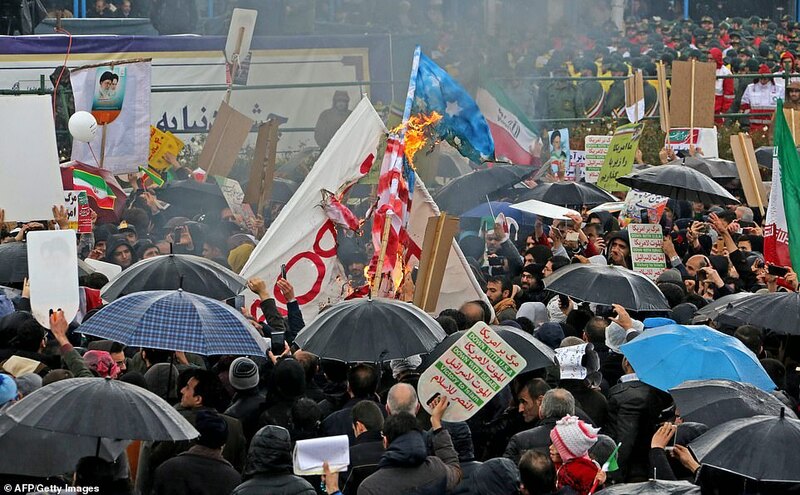 Demonstrations against the US-backed monarchy began the same year and very quickly developed into a campaign of civil resistance which intensified throughout the year. Between August and December 1978, the country came to a near-standstill due to mounting strikes and demonstrations across Iran. 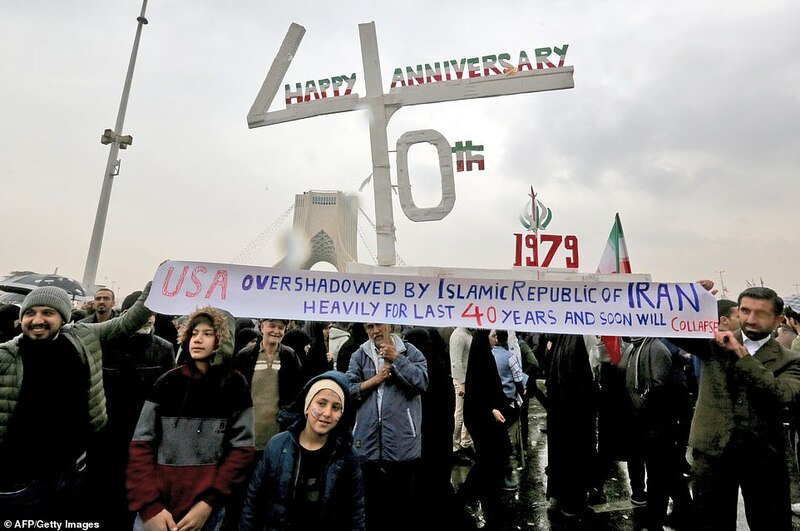 A few months later, on January 17, 1979, Mohammad Reza Shah Pahlavi was forced to leave Iran as the political unrest had transformed into a revolution. He was granted asylum in Egypt where he died in 1980 – knowing he would likely have faced execution had he ever tried to return to Iran. After the Shah’s exile, the monarch’s duties were left to a regency council and Shapour Bakhtiar – who served as the last Prime Minister of Iran under Mohammad Reza Shah Pahlav. Ayatollah Ruhollah Khomeini, an Iranian politician who spent 14 years in exile for opposition to the Shah, was then invited back to the country by the government. Iran’s monarchy eventually collapsed on February 11, 1979 when rebels overwhelmed troops loyal to the monarch in the street. 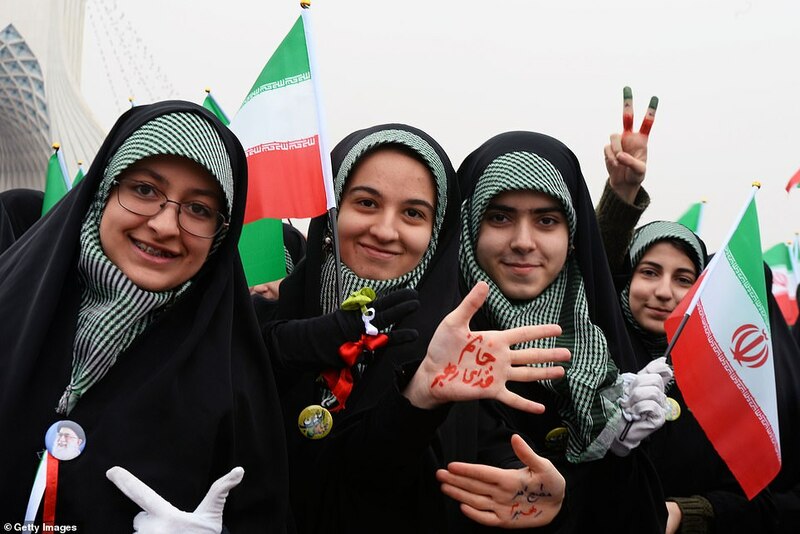 The country then voted by national referendum to become an Islamic republic on April 1 – and Khomeini became Supreme Leader of the state in December. 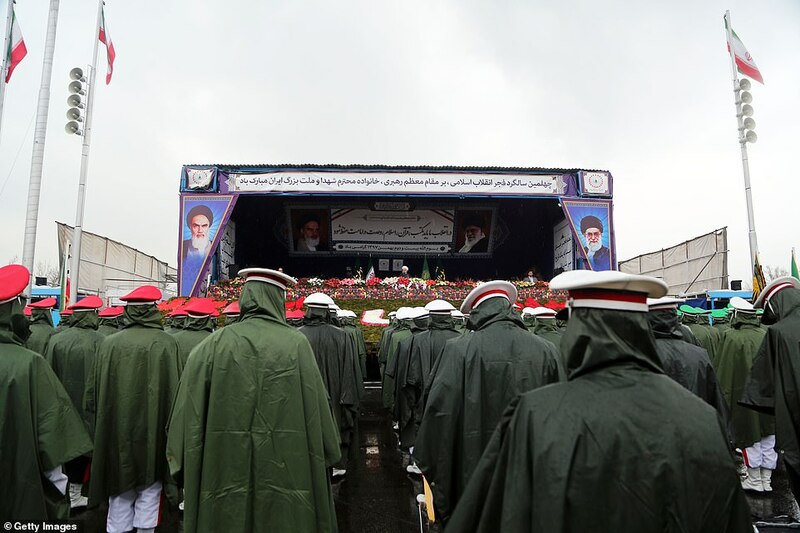 Elsewhere, the head of the elite Quds Force of Iran’s powerful Revolutionary Guard, General Qassem Soleimani, attended the rally in the southern city of Kerman. He said he wanted to teach his son to support the revolution. ‘I see a bright future for him and our nation,’ Hosseinpour said. He said: ‘My mother, despite her illness, asked me to bring her out’. Ms Fakheri, who was one of the revolutionaries on the streets of Tehran in 1979, said she would defend the revolution all over again. 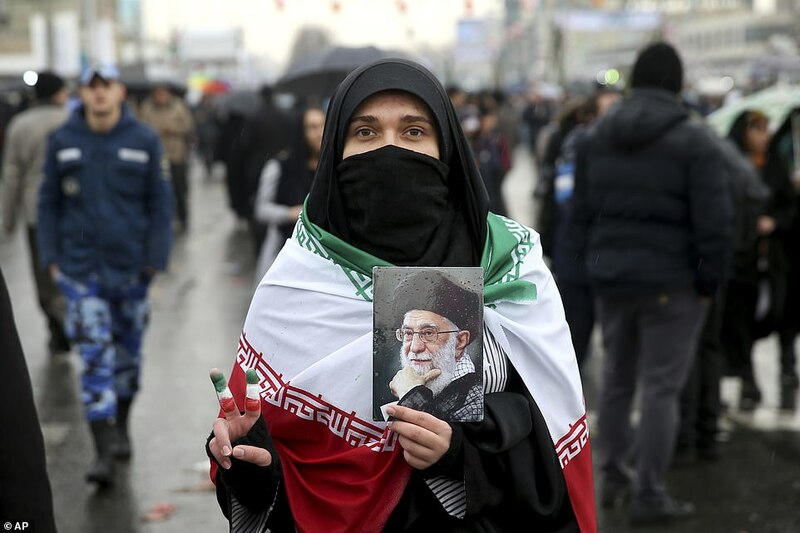 Last week, Supreme Leader Ayatollah Ali Khamenei defended the ‘Death to America’ chants, saying they are aimed at America’s leaders such as Trump and not its people. 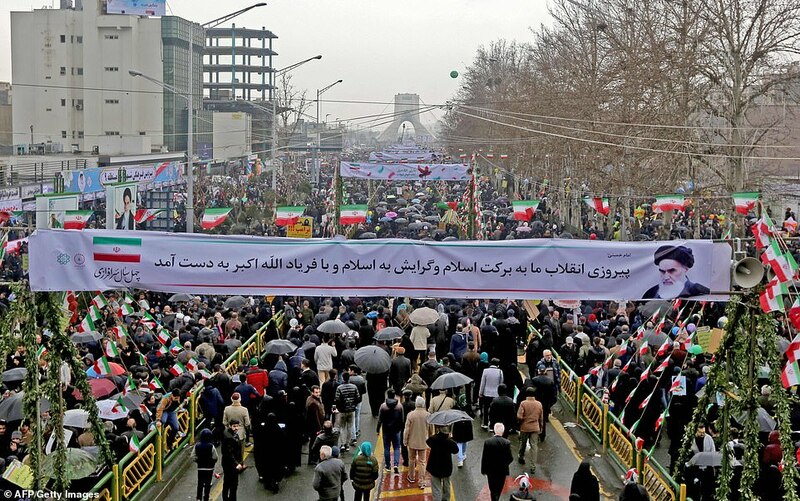 The Iranian people ‘will not stop saying “Death to America” as long as the US acts malicious’ toward Iran, Khamenei said. 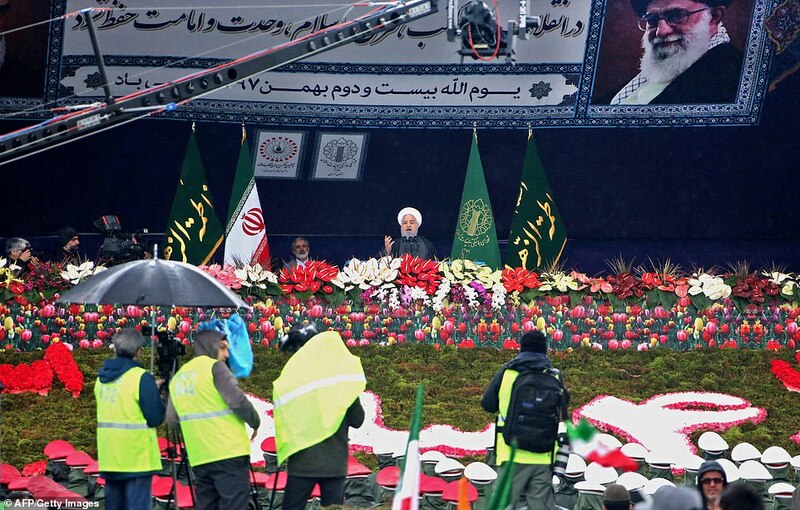 In a speech at Tehran’s Azadi Square, Rouhani said US efforts to isolate Iran would fail. ‘We will not let America become victorious. Iranian people have and will have some economic difficulties but we will overcome the problems by helping each other,’ he said. 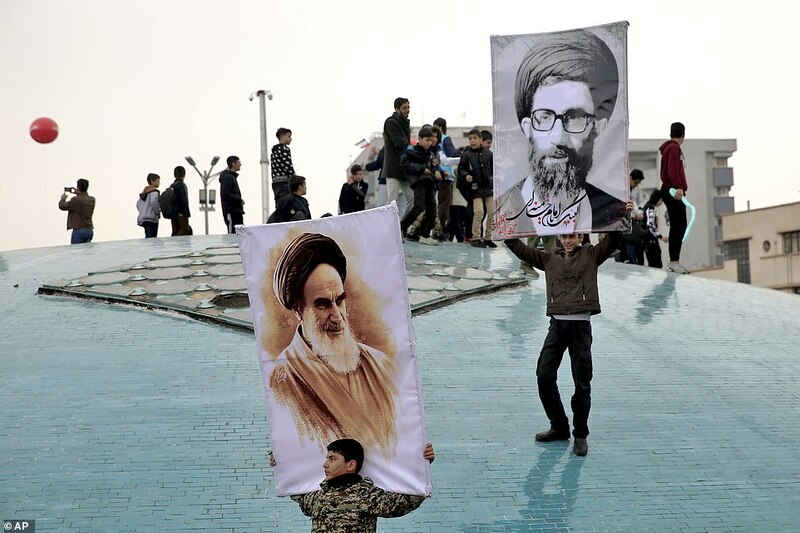 Washington and its Arab allies have viewed Iran with great suspicion since the Islamic Revolution, fearing Khomeini’s radical ideology would inspire militants across the Middle East. 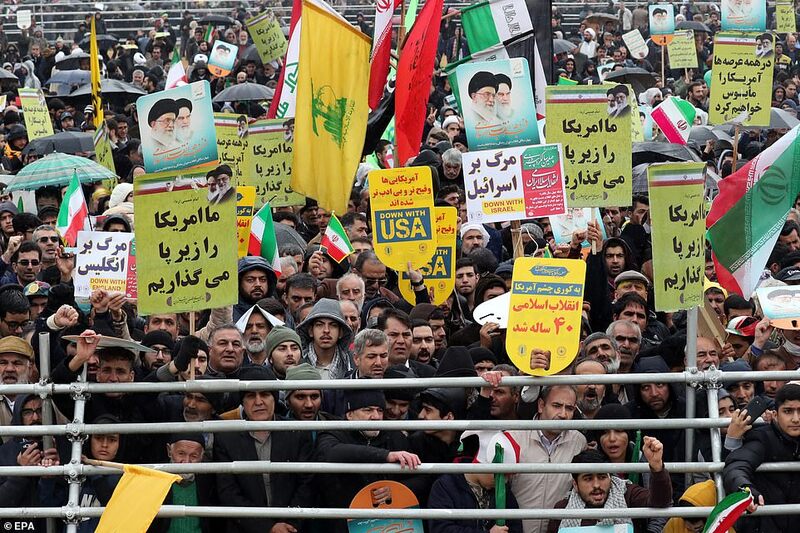 Today, the United States and its Arab allies are trying to counter Tehran’s growing influence in the Middle East, where it has proxies in Iraq, Syria, Lebanon and Yemen.